If you were being glib you could describe it as “Groundhog Day” redone as a thriller, but that would really be selling director Duncan Jones (“Moon”) sophomore effort short. It does cover a lot of the same existentialist themes about determinism and the nature of life. But it packs them into a tight thriller package that hinges not on plot twists (although there are several) as much as the handful character relationships which lie at its heart. Captain Colter Stevens (Jake Gyllenhaal) wakes on a commuter train to Chicago. Unsure where he is, he turns to the girl in the seat across from him, Christina (Michelle Monaghan), who calls him “Sean.” He insists on his own name, becomes increasingly anxious, doesn’t appreciate her joking (“You okay there, ‘Captain?’”). He makes his way to the bathroom, where a glimpse in the mirror reveals that he’s not himself, literally. Even when his wallet ID confirms he’s this guy Sean, a teacher, Colter resists. “I don’t know who Sean is and I don’t know who you are,” he tells Christina. She assures him, “Everything’s gonna be okay.” She’s right and she’s not right. The train explodes a moment later. After a massive explosion, a shell-shocked Stevens wakes up to the voice of Carol Goodwin , who explains that Stevens is integral to the success of a government programme called “The Source Code”. The Source Code programme allows Colter to re-live the last 8 minutes of a person’s life, without any consequences to the real world. It’s a bit like Groundhog day, but 23 hours and 52 minutes shorter.The premise is actually quite simple at the core, but becomes extremely complex as the film explores multiple concepts about how the source code works, and what the larger scope and understanding of what the source code truly is. What we get here is Groundhog Day + Quantum Leap + Twelve Monkeys all set to the tone and movement of a great Hitchcock film. The Chemistry only gets better as the movie moves forward! Gyllenhaal is actually very watchable as the trapped Colter Stevens – you certainly feel sorry for him as he struggles to make sense of the difficult situation he finds himself in. His on-screen rapport with Michelle Monaghan also enables some elements of humour to break through into a film that, for the most, storms along at a frantic, action-packed pace. The rest of the commuter train was made up of characters from all walks of life; the nervy guy from an ethnic minority background, a geeky student, a famous fat comedian, an elderly woman, a ‘tough’ businessman with a greasy pony tail. These characters were all cheesy stereotypes in their own right, but I guess the director needed to introduce these secondary characters pretty quickly, and making them archetypal was the quickest way of doing this successfully. His handler Goodwin (Vera Farmiga) must send Stevens back in time, back to the train, multiple times before he makes significant progress in preventing an otherwise inevitable disaster. Building suspense on top of suspense, the captain has eight minutes for each trip. From H.G. Wells’ The Time Machine through classic Star Trek characters tripping through the Depression-era United States in the series’ “The City On The Edge Of Forever” episode to Timecop and beyond, time travel is déjà vu in filmed entertainment. 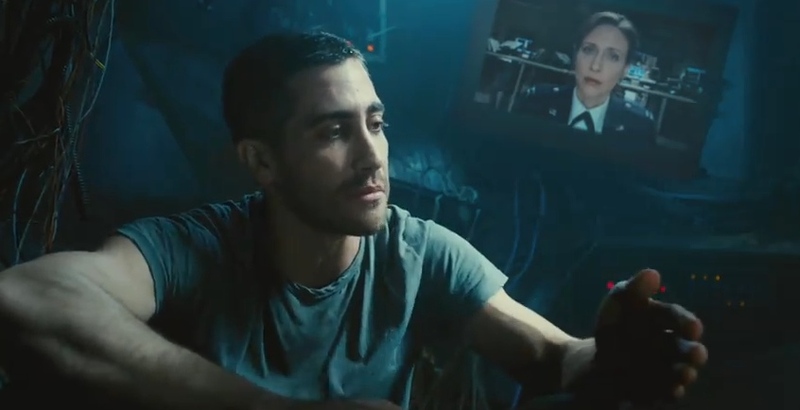 Source Code, however, raises the sci-fi subgenre’s tempo, consequences, technology and poignancy, mixing sci-fi, action, suspense, ethical quandaries and a love story. And all of the movie’s pieces come together beautifully within compact time and space. Now playing at Cineplex Adlabs, Bharath Mall, Mangalore!